Pakistan produce a near perfect performance to take the one-day series down to the wire. Before this current ODI series started, Faf du Plessis and coach Ottis Gibson said that they hoped the Proteas would get a proper workout against a very accomplished Pakistan team in 50-over cricket. Mickey Arthur’s visiting troops produced a flawless performance on Sunday in beating South Africa by a massive eight wickets at the Wanderers. It finally ended the home side’s unbeaten streak of six matches in the so-called Pink ODIs and, more importantly, ties the series at 2-all. That means Wednesday’s fifth and final match at Newlands will be the decider. 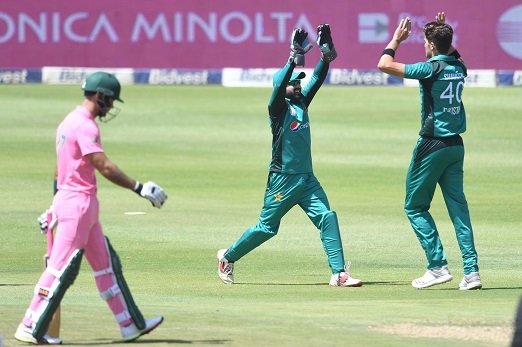 While they have been competitive throughout under Safraz Ahmed, they showed a cutting edge at the Bullring under veteran Shoaib Malik, who has replaced the regular skipper after he was suspended for four matches following the Andile Phehlukwayo incident. Malik astutely chose to bowl first after winning the toss, reasoning soundly that most life in the wicket would probably be present early on. 18-year-old Shaheen Shah Afridi gave his side a superb start in nipping out Quinton de Kock and Reeza Hendricks early. Normal service seemed to resume as the experienced pair of Hashim Amla and Faf du Plessis added 101 for the third wicket, but became visibly bogged down in the latter part of their stand. It led to Du Plessis holing out to deep mid-wicket for 57, before Amla (59) was caught on the crease by leggie Shadab Khan (2/42). From there on, South Africa’s batting showed an alarming lack of resistance. The chief destroyer was left-armer Usman Shinwari, who recovered from a below par opening spell to end with fine figures of 4/35. It represents the best bowling analysis in the history of the Pink ODI, which is usually dominated by the bat. The Proteas at least avoided the embarrassment of the lowest total in this picture, narrowly passing Sri Lanka’s 162 in 2017. The wily Dale Steyn delivered a decent opening spell without reward, but South Africa gradually lost their appetite for a fight. Pakistan opener Imam-ul-Haq continued his superb form in crafting 71 off 91 and was ably supported by Fakhar Zaman (44), who regained some of his touch, and the classy Babar Azam (41*).